Trevor Pateman's Philately Blog: What is Unusual about this 1919 Money Transfer Form? What is Unusual about this 1919 Money Transfer Form? Because they did not have any indication of value - no imprinted stamp - Money Transfer Forms and other formulars did not require Security Printing arrangements and in Imperial Russia were often printed locally. 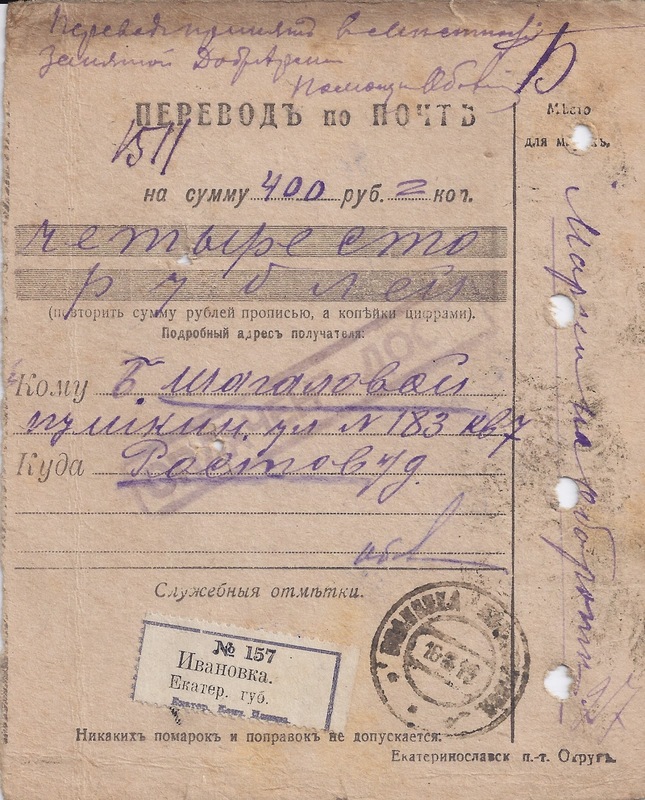 The place of printing is often indicated on the front at the bottom right as in the Formular shown above where you can read EKATERINOSLAVSK P - T OKRUG - Ekaterinoslav Post and Telegraph District. The Formular has been used to send 400 roubles from IVANOVKA EKATERINOSL[av] 16 6 19 to ROSTOV DON 18 6 19, charged at 1% as indicated by the 4 x 1 rouble imperforate Imperial Arms overprinted with the Trident of Odesa type 5d. I just assume that the Formular was used in the period of "White" control of the Katerinoslav district. Correct me if I am wrong! The real interest of this Formular is that it is a post-revolutionary reprint of the Imperial period Formular but with the Imperial Arms completely removed from the top left of the front side. In other Districts, you see the Arms defaced in post - 1917 reprintings but these Ekaterinoslav formulars are the only ones I have seen with the Arms completely removed. There were a couple of examples in the Zelonka collection and I also have two examples. My guess is that the reprinting dates from `1918 or even 1919 rather than 1917. The card stock used is of quite poor quality. Of course, this is not the only thing of interest on this Formular. I am sure readers can see others. 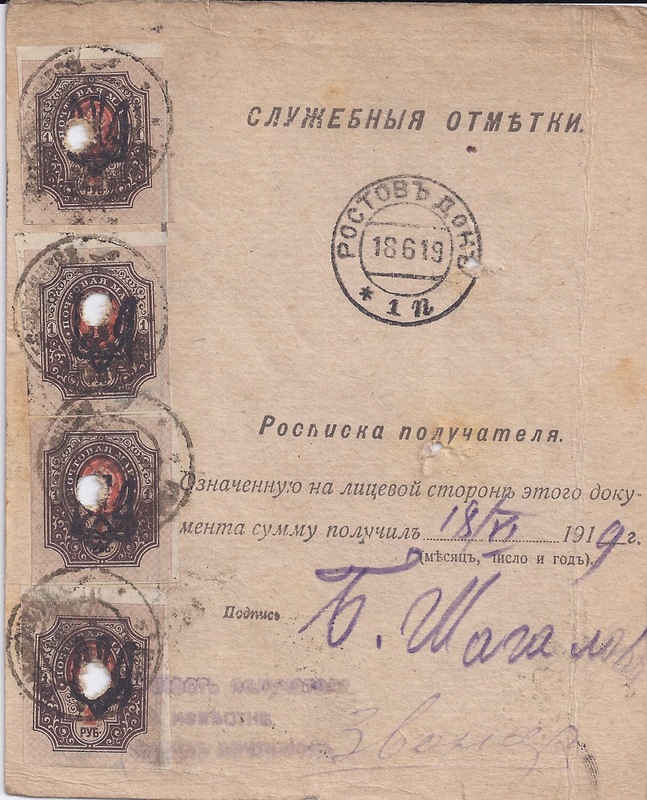 The History of Crimea in Postmarks? Allaverdi, Tiflis - Can You Help?